Flexwing Clothing – what do I need? Well, at the start, your instructor will supply you with a flying suit, mitts and a helmet with a headset. You can normally use the instructors kit for your training, but as your training progresses you may prefer your own. There are lots of different options for suits, gloves etc and its a case of looking round for the best gear to suit you. Because we are in Scotland, you will probably want some warm kit 🙂 There are excellent suits from Ozee and Blue Sky with thermal qualities. There are normal gloves, Thermal gloves for colder times and Bar Mitts. Bar Mitts are fastened to the bar, so you can pull your hand out with free fingers (for instance to change radio frequency) without the problem of dropping a glove. Some of the Bar Mitts have a see through pocket that you can slide in paper notes or a map. 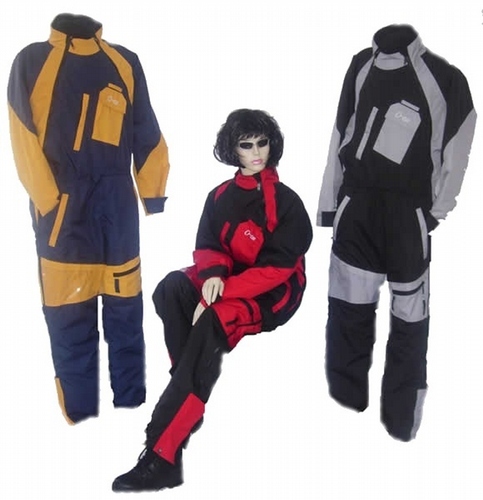 Some people also purchase the heated motorcycle gear that plugs into your aircraft. I have purchased heated gloves and a heated jacket from Gerbing. Both work very well, and make a huge difference when its cold. There are heated elements that can either plug into the flexwing’s electrical system, or have batteries that attach to the garments. The ones plugged in will always be better, especially for the longer journeys. You may want to purchase your own helmet. There are some helmets that have integrated headsets, and others that are separate. Different styles, colours and types are available, so have a good look. Do make sure that if you buy a headset that it will work with your instructors (or your own) radio. Helmet makes include Micro Avionics and Flycom. From time to time you will get second hand kit from Afors.com and ebay if you prefer.